The Historic town of New Market, Maryland has taken multiple steps in revitalizing Main Street and the community and has made some incredible strides. 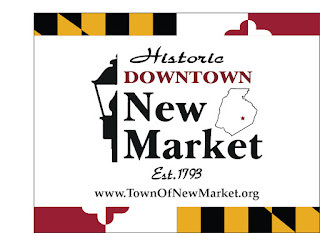 New Market is Open for Business and has a variety of Shoppe’s and Restaurants with new sidewalks, street parking and additional parking sites to accommodate the shoppers this holiday season as the Streetscape program with the State of Maryland has put final touches on this past Fall of 2017. 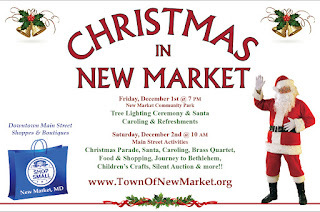 Don’t miss the holiday favorite this December 1st and 2nd with Christmas in New Market, a two-day Christmas festival with Santa and Shopping. Friday Shoppe’s will be open for shoppers to find gifts and treasures, then the Tree Lighting Ceremony will begin at 7 PM at the New Market Community Park along Main Street. There will be caroling and light refreshments, and an honored guest of Santa rolling into the park escorted by the New Market Volunteer Fire Department 15/25. Simpson’s Church next to the park will have caroling around 8:30 PM to continue festivities. Second day of the festival, Saturday, December 2nd get your spot early the Christmas Parade starts at 10 AM and will be traveling down Main Street with many local businesses and organizations promoting their staff, families and services, Linganore High School Marching Band, Oakdale High School Marching Band, Scouts and Dance Troops, Local Officials, Churches and our local organizations, full parade of fun for the whole family. 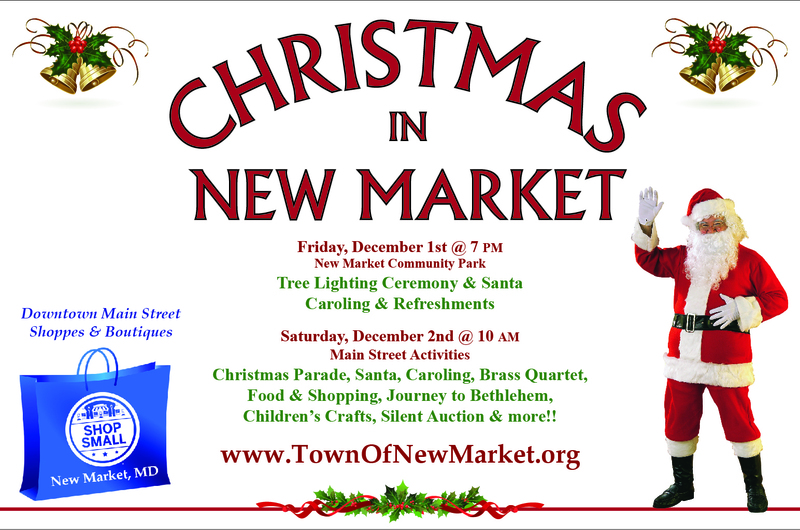 After the parade, a scavenger hunt will take place throughout the entire Downtown Historic District of Shoppes, Carolers, Brass Quartet, Food and Shopping, and a Journey to Bethlehem, Children’s Crafts, Silent Auction and other activities at each place of business and the big man himself, Santa Claus will be at Town Hall. A fun filled two-day event perfect to get you and your family into the Christmas festivities. Check out the activities on the Christmas Facebook Page @ChristmasInNewMarketMD for more details. The historic town has truly grown since being established in 1793 and has an entire community of neighborhood families, businesses and a wealth of a future. The town has a full business listing on www.townofnewmarket.org New Market has been encouraging the community and visitors to shop small at the growing list of local shops, restaurants, and activities that have been taking place with Second Saturday occurring every month with holiday events and activities in between. Stay tuned for the upcoming 2018 Calendar of Events, New Market is growing fast with a packed full event list of community based events from festivals, second Saturday events, holiday events and activities and educational and community seminars. The largest 2018 event is just around the corner, be sure to not miss the Quasquibicentennial Celebration of New Market, 225-year anniversary of the Town “Founder’s Day” to be held June 9, 2018. The Maryland Department of Housing and Community Development has named the town a Main Street Maryland Affiliate and the town will soon be growing to full Main Street program in 2018. Which will open more opportunities’ for the Town’s Business Community and the re-branding of the town, since the town has grown with a great variety of Shoppe’s and Boutiques that carry unique treasures and quality services. The town has also been designated a Sustainable Community by the State of Maryland so residents and businesses can apply for community improvement grants. 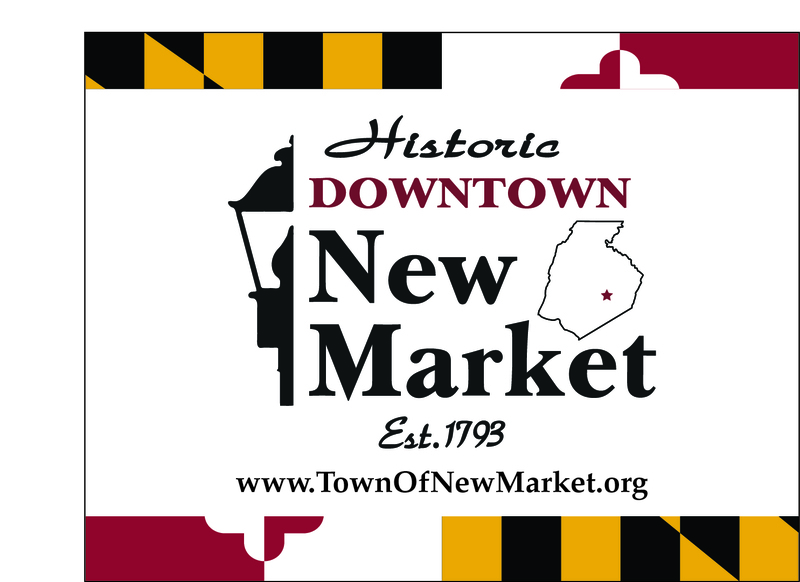 New Market has applied and been accepted to receive grant funding from the Community Legacy Grant from the State of Maryland to assist in the town’s re-branding efforts. Planning has started and will continue into the Spring of 2018 to set the plans in motion for a new look for the Historic town and its growing business community. The Green Team of New Market has also launched multiple projects in the past year to provide resources and education for our community. One of the largest projects is the "CSA" program. A Community-Shared Agricultural program launched Spring of 2017 and will continue to provide local grown fruits, vegetables, eggs, meat and more to the community from a local farm, Sycamore Spring Farm, who will be continuing the program into 2018 for the community to have fresh and local grown food. Along with some other important projects for the community such as The Poop Project, Composting Bins, Walking Trails & Business Map connecting our community to the Main Street Businesses. Keep your eye out for these projects within our community. The Green Team is working diligently for the Sustainable Maryland certification. To learn more Sustainable Maryland is a collaborative effort between the Environmental Finance Center (EFC) at the University of Maryland and the Maryland Municipal League. A new addition to the Town businesses is the New Market Plains Vineyards, located at 11111 W. Baldwin Road, next door to Adventure Park, which is in the process of annexing into the Town of New Market. 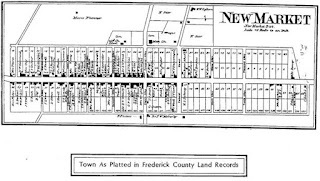 The first Town Plan for New Market, see map below was registered by Nicholas Hall under a deed of trust in the land records of Frederick County in 1793. 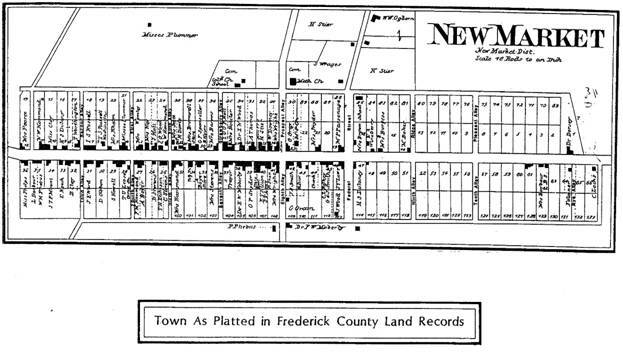 That first Town Plan had 170 lots organized in linear form along Main Street. Also known as Old National Pike or MD 144, Main Street was a part of the National Road which connected the cities of Baltimore and Frederick. The registered New Market Town Plan represented one portion of Hall’s 1049 acre estate known as New Market Plains and encompassed about 60 acres. With all the growth and revitalizing spirit of the Town of New Market, it’s a happening place you can’t afford to miss on your shopping travels this season and into the New Year!